"How do I launch my car?" "I'm making all this power,...but what does it take to get those incredible 1.7 sec 60ft times?" "I just can't seem to put any of this power to the ground"
Well...hopefully this little article will help you guys out. First of all, no matter how much power your car is making, you won't, and I stress WON'T, pull a good ET unless your car is set up properly for the track. You can't just bolt on a turbo and go out and expect to pull 12's or 11's. There's a lot of preparation that goes into making sure your car will put the power down. You have to keep an eye on your 60ft times! Those are the ones that tell you how your hooking up off the line. Sure, SURE!! !...it looks good to take off and smoke the tires in first, second, third, and for those few of you even fourth gear, but if you're not hooking up properly, your ET will suffer. Most 60ft's range in the 2.3 to 2.5 area. If you're running about 93MPH in the traps, then you'll be lucky to pull a mid 15 sec ET. However, if you take the same car, set it up properly, pull a 1.7 to 1.8 sec 60 ft, you're ET can drop all the way down to a mid to low 14 sec ET, and your MPH will increase slightly, maybe 1 to 1. 5 MPH. Now, do you see how important it is to watch your 60ft times? The reason that your MPH increases is because you're hooking up better and putting the power to the ground quicker, thus accelerating faster at the same given point. First of all you're going to need to make sure that your clutch is in excellent condition, if not, consider picking up a new heavy duty style clutch like our Redline PRO series or our ACT kits. These clutches don't slip under high rpm clutch drops and can handle up to twice the torque of a stock clutch. They are a necessity to pulling good consistent 60 ft's. Second, you're gonna need slicks! Yes...yes I know...some of you want to prove your "skillz" on street tires, but unless you have slicks, good luck getting your 60 ft's below 2.0 sec. I recommend small slicks (22x8) for Nitrous Applications and Big slicks (24x9) for Turbocharged vehicles. Reason being, when under NOS, top end falls off dramatically, so the smaller slicks will in essence reduce the overall gear ratio, allowing quicker acceleration. With Turbocharged vehicles, you want big slicks, because of a turbos inherent top end power. When the turbo starts making some real power the big slicks will expand and increase the overall gear ratio allowing much quicker acceleration. 1. Make sure to run your slicks correctly with inner tubes and rim screws. 2. If you have the power, reduce your tire pressure to the 12-9 psi range as real drag slicks don't begin to work until about this point. 3. Check your tire pressure before each run and bleed down the pressure as the pressure increases every run due to the heat of burnout's, etc. 4. Try to run rims as much inboard as possible. Reducing scrub radius makes the car easier to control. 5. 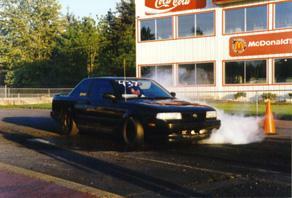 If you have the power, do your burnout in 2nd gear to heat up the slicks more. And you thought this was easy....Wait we're not done. Third, because FWD vehicles launch with the front wheels ( believe me, some peeps don't know this), you want to keep the available weight over the front wheels, and under a launch you want the weight to stay over the front wheels. You do this by emptying out your trunk (tool box; floor jack; spare tire; speakers; dead body). Now here's the important part: get some rubber spacers and place them in between the coils of your rear springs. This will prevent them from compressing under hard launches when the weight wants to transfer to the rear. You want to place enough of them so that you have a slight forward rake (front end and lower than the rear). Test them out by having a buddy watch to see how much the rear goes down under your launch. If it compresses more than .5 inch, your losing precious 60 ft time. This is probably the most important thing to do. I allows all the other things mentioned above to work in harmony. One more thing, some people have found that using a switch activated retard aids in the launch. The theory is: by retarding timing 10 degrees during the launch, it allows the driver to launch at a much higher rpm because you're reducing overall power. Once you're hooked, release the switch and the timing will return to you're normal optimal setting thus giving you all the power you normally have. Because you're already hooked, you'll move out with much better authority. You get up to the staging lanes and you see that third yellow. You want to make sure that your rpm's are high enough so that you don't bog, but not so high that you'll spin your slicks. So much as chirp can cost you .10 sec in your 60 ft. You release that race clutch ever so slightly (DON'T! !DROP the Hammer!!) while holding your Revs at the set given point. You want the car to feel like it's going to bog for a split sec, then you're outta there. With NOS and turbocharged vehicles the 1st to second shift will come so quick that you probably haven't even released the clutch out fully yet. Stick the clutch back in, go to second, and go on to win your race. On turbocharged vehicles, keeping you're foot on the gas during the shift ( which must be done quickly) improves you're ET dramatically. It maintains boost pressure in the intake manifold thus giving you more to start with in each higher gear. The difference from "Speed Shifting", what this style of driving has become labeled as, and regular driving can mean as much as half a second and up to 5 MPH in you're trap in mildly turbocharged vehicles.